A few days ago both the New York Times and the Wall Street Journal cited anonymous officials who claimed that North Korea was responsible for the recent cyberattack on Sony. These agenda-setting elements of the press conveyed the information without question, despite the fact that the evidence provided has been (as journalist Kim Zetter put it) flimsy. Contemplating the corresponding headlines is instructive. As I wrote in the Times back in September of 2014, sophisticated anti-forensic technology is actively being developed by both American intelligence services and private sector companies. To think that other countries aren’t doing the same is naive. False flag attacks are standard spy tradecraft. Furthermore high ranking, ostensibly credible, national security officers like Keith Alexander, James Clapper, and John Brennan have demonstrated the tendency to lie to the American public. Not small innocent lies but rather colossal brazen lies. Lies regarding essential constitutional rights. Why, pray tell, should we trust what we’ve been told by officials? Your author contacted Zetter to offer the proverbial high-five and she voiced her frustration about the utter lack of skepticism by reporters like Sanger and Perlroth. Blind acceptance is part of the miracle of modern propaganda. As Noam Chomsky and Edward Herman described in their classic text Manufacturing Consent the large multinational corporations that constitute the mainstream press are able to frame debate and control the acceptable boundaries of public discourse by leveraging an apparatus which burns through literally hundreds of billions of dollars each year. Of course this isn’t the only instance in which the stalwarts of the corporate media have botched their job as society’s watchdogs. Anyone following what’s happening over in Ukraine will also notice an astounding groupthink on behalf of the press corp. What’s painted as Russian expansion is really a NATO expansion. Putin is responding to Western incursion. Even an establishment figure like Henry Kissinger admits as much (and when a guy like Kissinger starts making sense it’s a sign that something is seriously amiss). 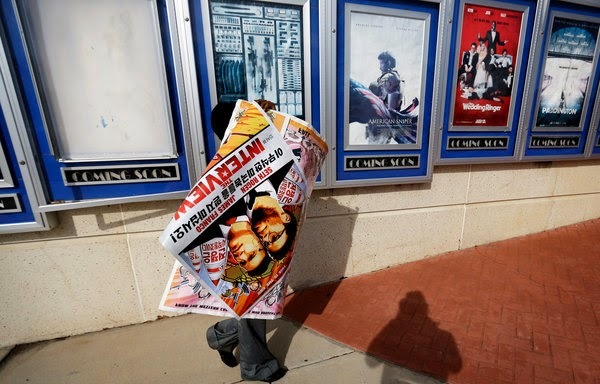 North Korean Role in Sony Hack Presents Quandary for U.S.
All of this underscores the role of modern propaganda as an incredible tool of social control, a textbook application of the science of coercion. The public is so distracted with celebrity gossip, mindless entertainment, wildly inflated alleged national security threats, and empty consumption that they fail to recognize the unraveling of our social fabric. Officials hyperventilate over an obscure contingent of jihadists while disregarding far greater, but less spectacular, threats. Sadly the countervailing ideologies and organizations that served to keep capitalism in check in the aftermath of World War II have dwindled. Hence the plutocrats who funded the neoliberal revolution have a captive audience and they’re free to kick and beat the rest of us with relative impunity, while sanctioned policies like Quantitative Easing and offshoring allow them to swallow up nearly all economic gains. And to think that former NSA director Keith Alexander had the audacity to claim that Chinese cyber espionage entailed the greatest transfer of wealth in history? Never mind the trillions spent on the self-perpetuating military conflict in the Middle East. As inequality grows and the global climate becomes less habitable, the immiseration of the average Joe will inevitably lead to mobilization. The ruling class is well aware of what happened to French aristocrats in the eighteenth century. To save themselves from a similar fate they will switch the cogs of the Mighty Wurlitzer into high gear to give voice to popular discontent and subsequently co-opt emerging movements. That’s how fascism normally works. Mass interception will also be employed to identify activists and independent thinkers who see through the deluge of clever propaganda. Likewise a militarized police force guided by programs like Garden Plot will be waiting in the wings as a last resort. When this juncture is reached, where a critical mass of people are angry enough to take action, the likelihood of a positive outcome will depend in part upon people acquiring access to alternative sources of accurate information. In this way organizations can foster accountability and properly apply the sustained pressure necessary to alter large systems. Looking out over a media landscape flooded by corporate money and an endless series of murky deep-pocketed foundations, a modest reader–funded outfit in Petrolia, California, is an encouraging sign: Season’s Greetings CounterPunch. Bill Blunden is an independent investigator whose current areas of inquiry include information security, anti-forensics, and institutional analysis. He is the author of several books, including The Rootkit Arsenal and Behold a Pale Farce: Cyberwar, Threat Inflation, and the Malware-Industrial Complex. Bill is the lead investigator at Below Gotham Labs.